Simply connect your cable or xDSL modem with Ethernet connection to the 10/100/1000Mbps WAN port for instant always on internet. 4-PORT 10/100/1000Mbps GIGABIT LAN SWITCH WITH AUTO MDI-MDIX Connect Gigabit Ethernet devices, such as Network Attached Storage (NAS), and transfer large fi les or stream media content at up to gigabit speeds. Delivers speeds up to 300Mbps and up to 11x the coverage. Perfect for streaming video and music, online gaming and networking multiple PC's. NAT FIREWALL WITH STATEFUL PACKET INSPECTION (SPI) Provides protection from hackers and Denial of Service attacks by analyzing individual data packets, to ensure that only authorized packets are allowed access to your network. WPA/WPA2 ENCRYPTION Prevents unauthorized access to your wireless network and insures your data is secure. Wi-Fi PROTECTED SETUP™ (WPS) Makes wireless security setup easy with push button and PIN confi guration methods. INTELLIGENT STREAM HANDLING TECHNOLOGY Automatically manages and prioritizes the fl ow of time-sensitive data in your local network and going to the Internet, without the need for end user confi guration. As a result time-sensitive applications like online gaming, voice and video, run smoothly without lag and breakup. Simple and straightforward set-up with the intuitive web-based management interface and EZ™ Installation Wizard. The Barricade™ N ProMax Draft 11n Gigabit Broadband Router (SMCWGBR14-N) is the perfect all-in-one networking solution for connecting and sharing your high speed cable/xDSL internet connection. Designed for the home and office, this platform independent multi-functional router combines a 4-port 10/100/1000Mbps LAN switch, high speed Wireless-N (draft 802.11n) access point, NAT firewall with Stateful Packet Inspection (SPI), Intelligent stream handling technology, a Multi-function print server and a User friendly web-based management interface in one convenient device. 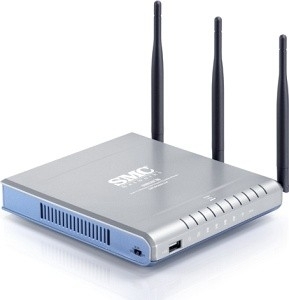 apc magazine : SMC BarricadeN Wireless Router: scanner sharing included? and Modem with Ethernet connection. or 2.4GHz 802.11b/g wireless adapter installed on each PC. Alternatively an Ethernet adapter can be used.